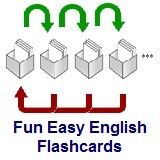 ﻿ Fun Easy English - new american english language vocabulary pictures words dictionary study practice flashcards presentation kids solar system. This lesson has 10 flashcards with pictures of the solar system along with their descriptions in English. <iframe src="https://docs.google.com/presentation/embed?id=1HHQCqeEKzV1um_Tc7HkNEqE0S3yhUJv4efa0XpgQ-mI&start=false&loop=false&delayms=3000" frameborder="0" width="480" height="389" allowfullscreen="true" mozallowfullscreen="true"